VAIL MILLS — Stuart Bond and Mike Piska each carded rounds of 39 to lead Broadalbin-Perth to a 161-181 victory over Glens Falls in a Foothills Council golf match at Holland Meadows Golf Course on Monday. Matt Danise had a 40 for B-P (2-0 overall, 1-0 Foothills), while Brandon Miller added a 43. Brayden Dock had a 40 to lead Glens Falls, Rece McClements posted a 41 and Sean Pettis finished with a 46. Colin Fisher added a 54 for the Indians. JOHNSTOWN — Ethan Wager carded a 40 to lead Johnstown to a Foothills Council victory over Hudson Falls at Fox Run Golf Club. Tyler Kortz posted a 41 for the Sir Bills, Colin Kowalski had a 43 and Liam Ackerbauer added a 46. Eric Purdy paced Hudson Falls with a 43, while Ben Schwartz had a 45. Zane Ovitt registered a 46 and Nate Stickney added a 51. AMSTERDAM — Erin Rivera finished with a round of 42 to lead Amsterdam to a Foothills Council victory over Schuylerville at Amsterdam Municipal Golf Course. Ryan Welch posted a 44 for the Rams, Andy Welch had a 47 and Andrew Iannotti finished with a 48. Ben Follos led Schuylerville with a 42. 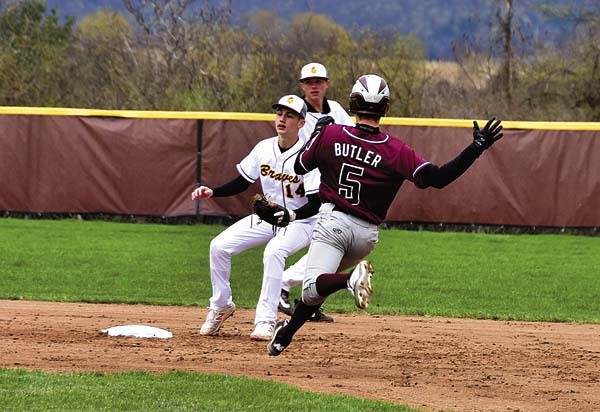 GLOVERSVILLE — Nick Vincent recorded a 45 to lead Gloversville to a Foothills Council victory over Hudson Falls at Kingsboro Golf Club. Lane Daley had a 47 for the Huskies, Jacob Campione posted a 49 and Matt Butkevitch carded a 50. Eric Purdy posted a 46 for Hudson Falls, while Dan Hess had a 47. Ben Swartz carded a 49 for the Tigers and Nate Stickney added a 59.